This burial mound, about 13m in diameter, stands on a promontory in the Loch of Stenness (Orkney). The entrance is on the east-north-east side of the cairn. A long and narrow passage leads to the 6.6m long chamber, divided into five compartments by pairs of upright slabs (some of them are broken, as seen in the photo). 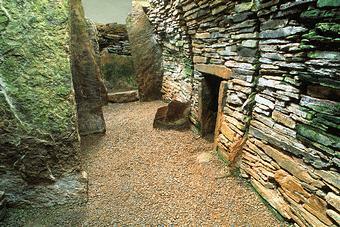 In the middle of the west side of the chamber is the entrance to a side chamber. The site appears to have been entered by Viking tomb-robbers who carved some runes and a stylised bird on the lintel stone of the side chamber. Excavation in 1884 produced many bowls of a type often found in Orkney tombs: since then, this kind of pottery has been called Unstan Ware. Remains of inhumations were also found in both chambers.